Q: On September 13, the spokesperson of the US Department of State Heather Nauert said that diplomacy is still the first and foremost and the preferred approach of the United States to resolve the Korean Peninsula nuclear issue. In a statement issued by the Russian Foreign Ministry on the same day, Russian Foreign Minister Sergey Lavrov emphasized that the Korean Peninsula nuclear issue can only be settled through political and diplomatic means. In addition, the United Nations (UN) Secretary-General Antonio Guterres said that all relevant parties should go all out to create conditions for the diplomatic and political settlement of the Korean Peninsula nuclear issue. 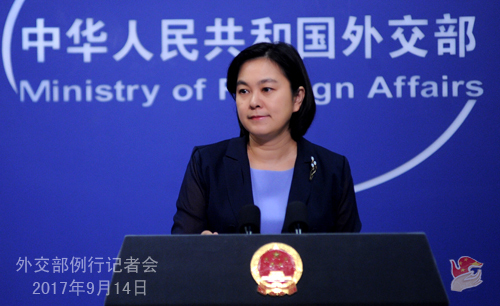 What is China's comment on the above-mentioned remarks? A: we have taken note of relevant reports. Indeed, the international community has a remarkable degree of consensus on staying committed to realizing the denuclearization of the Korean Peninsula and peacefully resolving the Korean Peninsula nuclear issue through political and diplomatic means because this best serves the common interests of all relevant parties and the international community. That is the clear direction taken firmly by the international community. The problem is how to work in that direction. The "suspension for suspension" initiative proposed by China aims to find the breakthrough for the situation on the Korean Peninsula to walk out of the woods while the "dual-track approach" focuses on taking multi-pronged measures and addressing the legitimate security concerns of all relevant parties through dialogue and consultation in a balanced approach so as to find a long-term solution to the issue. We call upon relevant parties to give positive consideration and make constructive responses to them. Certainly, if other relevant parties have better proposals, we will welcome and remain positive and open to them as long as they are conducive to peacefully resolving the Korean Peninsula nuclear issue, upholding the peace and stability of the Peninsula and promoting the resumption of peace talks at an early date. We also call upon the parties directly concerned to seize the opportunity and demonstrate the political courage to make the right political resolution at an early date. Q: The UN Secretary-General Antonio Guterres recently said that he will consider serving as the mediator for the settlement of the Korean Peninsula nuclear issue if the permanent members of Security Council can reach an agreement. Will China support Mr. Guterres as the mediator for the Korean Peninsula nuclear issue? A: The Chinese side always stays committed to realizing the denuclearization of the Korean Peninsula, safeguarding the peace and stability of the Peninsula and resolving the issue through dialogue and consultation. Bearing the above-mentioned position in mind, China welcomes all the efforts that can contribute to realizing the denuclearization of the Peninsula through political and diplomatic means and maintaining the peace and stability of the Peninsula. Q: It is reported that President Donald Trump has blocked a Chinese private equity firm from purchasing a US chipmaker. What is China's response? A: I am not aware of the specific takeover project mentioned by you. I would like to reiterate that the Chinese government always encourages Chinese enterprises to conduct outward investment and cooperation in accordance with the market principles and international rules and on the basis of abiding by the local laws. We also hope that relevant countries can level the playing field for the investment of Chinese enterprises. I have noted that this morning the spokesperson of the Ministry of Commerce also took relevant questions. Q: Jean-Claude Juncker, the President of the European Commission, said that the takeover of the enterprises of the European Union (EU) by the foreign investment must be strictly overseen. Some people think this is directed at China. What is your response? A: You said that the relevant remarks of the President of the European Commission or some of the measures that the EU intends to introduce are directed at China. Have the EU officials said so? Or did you speak for them and think the relevant remarks or measures are directed at China? 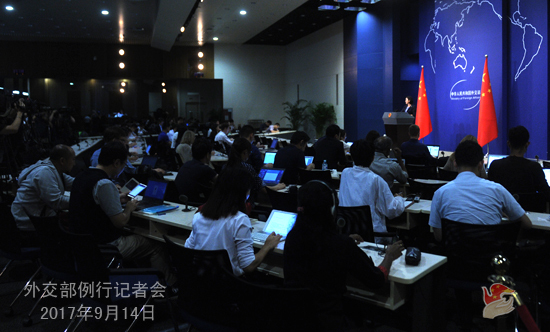 Journalist: They haven't said that the relevant remarks or measures are directed at China. A: I have been following the recent reports. I think that there has been much conjecture from the Japanese media. It is better to let the Europeans speak for themselves. In principle, we always encourage and support promoting trade and investment facilitation and liberalization. Especially against the backdrop of the current global economic situation, we hope that all relevant parties can make concerted efforts to create a fair, equitable, transparent and sound environment for conducting trade and investment with each other. Q: It is reported that as the only candidate, Madame Halimah Yacob, the former Speaker of Singaporean Parliament, was elected as the new president of Singapore uncontestedly. She will be sworn in at the Presidential Palace this evening. What is China's comment on this? A: The Chinese side congratulates Madame Halimah Yacob on being elected as the new president of Singapore. Singapore is an important member of the Association of Southeast Asian Nations (ASEAN). China values its relations with Singapore and stands ready to work with Singapore to move forward the China-Singapore all-round cooperative partnership progressing with the times. Q: The UN Secretary-General Antonio Guterres yesterday urged Myanmar to stop the persecutions on Rohingyas. 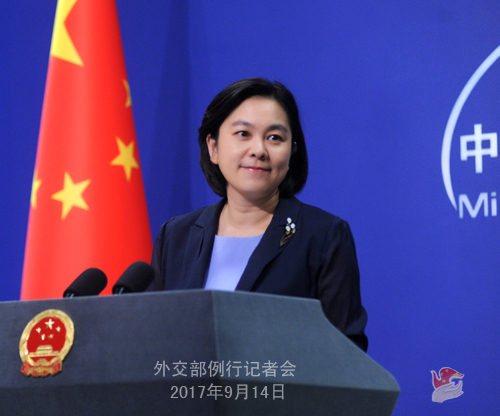 Has China also urged Myanmar to stop the military actions in the Rakhine State? A: Myanmar is a friendly and close neighbor of China. The Chinese side sincerely hopes that the Rakhine State can restore stability as soon as possible and the local people can live a normal life again. The Chinese side has stated relevant positions on multiple international occasions including in the United Nations and we stand ready to continue maintaining communication with all relevant parties and foster an enabling external environment for the proper settlement of relevant issues. Q: The Japanese Prime Minister is in India for a two-day visit now. Indian Prime Minister Narendra Modi will meet with him. Reports have said that the two sides are going to discuss defense and security cooperation and India's purchasing of the US-2 amphibian aircraft from Japan. What is your response? A: We have noted the report on Prime Minister Shinzo Abe's visit to India. With regard to what specific contents they are going to discuss, it is up to the competent authorities of Japan and India to release the relevant information. As for the Chinese side, we always maintain that countries should develop relations on the basis of observing the purposes and principles of the UN Charter, the international law and the basic norms governing international relations. We advocate that regional countries should make joint efforts to engage in dialogue instead of confrontation, forge partnerships instead of alliances and build an Asia-Pacific partnership featuring mutual trust, inclusiveness and mutually beneficial cooperation. We welcome and hold an open attitude towards the development of normal relations between neighboring countries. We hope that relevant countries can play a more constructive role in enhancing mutual trust and cooperation between regional countries and upholding the regional peace, stability and development.